Kathleen has been in private practice in Liverpool’s Rodney Street for nearly two decades. During this time she has treated thousands of people from the unemployed to the rich and famous. It has been one of the most successful and satisfying periods of her life and her enthusiasm remains undaunted. Kathleen first became interested in the power of the mind back in the 1980′s and has since studied with several hypnotherapy schools gaining qualifications of the highest standards in the very latest techniques. She is committed to ongoing training and professional development. She feels very fortunate to have met and to be of help to some very wonderful people. Some have been at the top of their respective amateur or professional sport, some in TV and the media many high ranking professionals and many more who lead not so glamorous lives but whose change in life was every bit as important to them. In each and every case the client's confidentiality has and will always be maintained. David Reeves, president of the National Register of Advanced Hypnotherapists awarded Kathleen with a life membership of the management committee ten years ago, something she is very proud of. She is well respected by her peers and colleagues, her honesty and integrity is admired by many as is her loyalty and dedication to her work and her clients. She is altruistic by design and wants only the very best for each and every client, working with them to help them to get to where they deserve to be, to reach their true potential. Kathleen’ s motto is ‘Limitations exist only in the mind’ a phrase she coined back in the nineties! Kathleen became a published author in June 2014 when her first two books The Candyfloss Tree and Unicorn Bridge first went into print. Since then she has published four more books about ‘Life on Belles Haven. They are inspirational motivational books for young people to help them to understand at an early age how important it is to have values in life. The series feature unicorns, fairies, wizards, a phoenix and many more quirky, mystical and magical creatures. They are fun as well as having those good sound underlying moral values within each of them. Kathleen says ‘I am always encouraging people to focus on their dreams and to learn to manifest them, to bring them alive. I thought it was time to do something special myself. If you have an idea, a dream you would like to accomplish then ignore the naysayers, doubters and negative people who tell you you can’t achieve your goals. those who tell you you are not good enough are only jealous of your talents. Focus is everything. Belief in yourself is paramount. Gratitude is essential. Believe you will reach your goal and let nothing get in the way. Feel it, think it, breathe it, Love it and know with an unshakeable knowing that you will reach it. And you will. Kathleen's interest in psychology began in the 1980's and the more she studied the more fascinated she became. She then went on to become certified through the UK's Hypnotherapy Control Board in Hypnotherapy and Hypno-Analysis and then went on to qualify with The Corporation of Advanced Hypnotherapists and The Atkinson Ball College of Hypnotherapy and Hypnohealing. 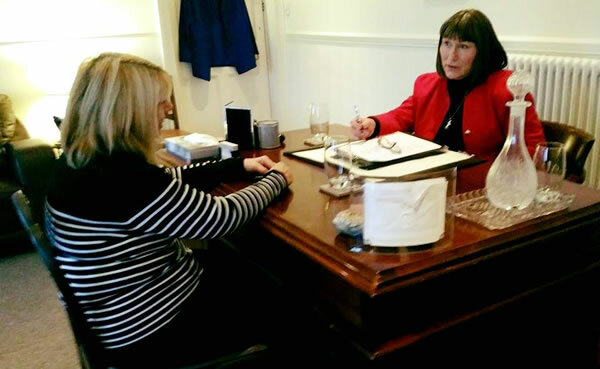 She is committed to ongoing training and with twenty years experience is the longest established hypnotherapist in Liverpool's Rodney Street, the Harley Street of the north. Kathleen has been a member of the N.R.A,H since the late nineties and in 2006 was asked to join the Management Team and was duly appointed to the post of regional meetings coordinator and given life membership. Outside of hypnotherapy Kathleen is also an author and illustrator, she works frequently with many different charitable organisations and is a border collie enthusiast. She has rescued and rehabilitated fifteen collies to date and fostered many more.